The grey brick and mortar walls, so distinctly Chinese and so beautiful, are being demolished; the old neighborhoods they encircle and the narrow alleys they delimit torn down. Of the 7000 hutongs* of 1949 Beijing, only 137 remain. The unremitting thrust of modernization and urban expansion has overhauled the old and replaced it with the new, and not only in Beijing but far beyond the coast and China’s boomtowns. This trend is in line with the nation’s objective to become a “well-off urban society” 1 — a society that provides the foundations for a modern lifestyle, and offers the opportunity to become rich and independent. However, at the same pace at which the walls of ancient China crumble, new gates and fences are erected. Upmarket residential areas, built as fully-fledged gated communities, are bursting forth across the nation. As China opens up to the world and its economy stretches out, its well-off population is preparing for lockdown*. Around the world and in a variety of forms the phenomenon of fortification has made its mark: in South-America it is a village surrounded by barbed wire and cameras; in the US, communities for senior citizens are enclosed by deserts; in cases like Dubai complete cities even are being constructed as a continuous patchwork of fenced-off neighborhoods, controlled commercial compounds and mega-buildings. The fort typology is a response to an increasing demand for seclusion, a sense of safety, and community living. The words that have evolved to describe the nature of these communities are as diverse as they are amusing: Privatopia*, Nerdistan*, Euroghetto*, Vertical Themed Community, Golden Ghetto*, Split City*, Teletopia* — all refer to enclaves where citizens have flocked together based on an ideology — a lifestyle — composed of either fear or hope. But more importantly the enclave should be understood as the typological success formula of market-controlled urbanization; most notably in areas of rapid growth. In the West this upsurge of walls has sparked a debate linked to social segregation and loss of public space. The public domain is reduced to (increasingly sophisticated) controlled commercial environments; spaces in between the enclaves are relegated to the status of leftovers. Increasingly inaccessible and of desperately poor quality, they only barely hold the city together. If the city is nothing more than a collection of islands and in between space its role as a communal environment is at stake. The enclave should be understood as the typological success formula of market-controlled urbanization. Nowhere has this formula been implemented more vigorously than in booming China. 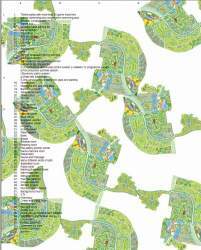 Neighborhoods with characteristics to fit any of these odd titles can easily be found. And although the debate never started, within the context of China’s warped economic development, the consequences of fortification are more profound than in the West. As the privileged draw together behind walls, the new classes of China’s once classless society are sharply delineated. Developers, landowners, investors, and residents have together invented a new territory within a territory. Entire networks of residential areas arise like interlinked modern fortresses, with private infrastructure, privatized services and self-governance. The gates and guards are just a symptom of a process of stratification that is less visible but evermore decisive for the spatial, organizational, and social order of China’s urban society. With every wall erected, it becomes more apparent that the enclave has claimed a central role in China's urbanization process. Even though in China the gated community is omnipresent, its appearance has hardly been recognized, let alone challenged. Rapid and uncontrolled urbanization consumes all attention, and gated communities are hardly remarkable in the new urban landscape. China has a longstanding tradition of enclosing and framing the urban fabric: the protected compound and the walled apartment buildings are not regarded as alien bastions, but as shining examples of regeneration and (unobtainable) Western luxury. In Chinese architecture and urban planning the wall has always been an important means to reify and underline the social structure. From the sequential courts of imperial China to the homogeneous strips of communist work units, the block has been used as the elementary component of society. The pre-communist city consisted of communities of the same clan, position, or occupation, and every individual was a member of a walled society. The life of the nobleman unfolded within the confines of the courtyard; life for the commoner was lived out within the crammed quadrants of the hutongs; and every Chinese farmer was surrounded and protected by the Great Wall. With the birth of the People’s Republic of China the grey walls were built in concrete and erected around the industrial compounds. No longer necessary to protect anyone, they provided workers throughout community with clear political boundaries. The modern Chinese enclave took shape with the arrival of the first group of Westerners in Beijing, shortly after the reform. The expatriates were not allowed to settle in amidst the Chinese population. Common homes or apartments were hardly available on the free market and of very poor quality. When housing legislation was eased, developers seized the opportunity to respond to the demands of the foreign employee with homes of Western quality and comfort. Built as small groups of lavish apartment towers, they were the first neighborhoods to be distinctly disconnected from society. When prominent Chinese, looking for privacy and luxury, began to occupy these apartments, both the free housing market and the Chinese gated community became a reality. The danwei* meticulously eliminated all uncertainty for its residents and provided for most needs from cradle to grave. Issues of politics and the party but also personal matters such as housing, recreation, education and approval for marriage were arranged by the work unit. In turn the resident was forced to live as part of the collective and to use the shared facilities such as toilets and kitchens. In two decades the securities of the danwei* were lost. With the unwieldy transition from a collective and totally orchestrated society to one dominated by market forces, the average Chinese saw all of what he took for granted being washed away. Particularly the Chinese peasant is today left to fend for himself. He is not yet regarded as an individual, but he is fully responsible for his individual success and survival. Unremitting mass migration resulting in overflowing cities, insufficient public amenities, expanding suburbs and imminent social upheaval are the logical consequences. China’s gated communities have to be regarded within this framework. The new upper-class wants to dissociate itself from the masses and to break free from the chaotic and polluted urban realm, but is in reality completely surrounded by both. For those who can afford it, looking for new security behind the walls of privatized communities is a prophetic measure. In addition to the quest for security, the success of the closed community is driven by a quest for a modern lifestyle. The efforts of China’s wealthy to individualize and adopt a Western identity are enormous. The Chinese enclave, from its start as a refuge for expatriates has been surrounded by an aura of Western luxury and eminence. Chinese developers have successfully capitalized on a growing hunger for status by building on the gated community’s inherent qualities of safety, and cultivating a flair for contemporary foreign chic. 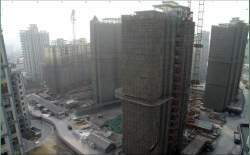 Today China’s booming housing production is saturated with developers building only for the top of the market. The residential expansions are dominated by gated apartment buildings and gated neighborhoods. Through extensive market-research the group of potential home-owners is identified, categorized, and carefully targeted. For every echelon of the market a specific type of community has evolved. The combined factors of location, available facilities, architectural style — mainly variations of the so-called Eurostyle* — and building density define the status of the property. Even for the lower sections of the enclave market a sense of splendor and convenience have been achieved. Tall apartment towers are built in ever larger clusters. This leaves enough (financial) room to incorporate a number of facilities such as parking, club house and green space. Through this ingenuity the residential complex has developed into a range of new types; the tallest, largest, most compact and (if you include Hong Kong) most expensive exist today in China. These different types however are socially homogenous; fortification of market-driven real-estate has rendered the residential areas in China spatially and socially isolated. The Chinese government encourages the construction of autonomous residential districts and compounds. As such the enclave contributes not only to social segregation, but also affects the administrative structure. The national government even urges large residential projects to be built with the full array of fences and safety measures. Equipped with private security and governed by neighborhood committees, the enclave saves the state money and relieves it (at least in part) of its responsibilities to administer and maintain order. Their residents, once abiding by the laws of the danwei*, are now subject to house rules and social control established by a private enterprise. This makes the modern Chinese enclave as an administrative entity a compelling replacement of the danwei*. The private projects are used to spot-burn holes in the once completely state-owned carpet. The shift of power to private parties reinforces the fragmentation of jurisdiction. Vice versa, the fragmented jurisdiction stimulates the construction of gated communities. The responsibility of the different authorities involved in large residential projects is unclear. Moreover the number of contradictory and temporary rules and regulations contribute to the confusion*. This hampers the implementation of strategic plans made by regional (and national) government, and creates a hazardous milieu of obscurity and uncertainty for investors. Little room is left to engage in solutions of potentially greater social durability. Within the warped and disorganized urban context, clearly defined and fenced-off building sites are more appealing. The gated community has become China’s tried and tested investment model for minimum-risk residential development. The gated community has become China’s investment model for minimum-risk development. The procedures to develop a residential compound do not contribute to clear-cut city planning either. The government allocates an area and invites a small group of investors to take part in the development. The area is broken up into different building sites and rough directives are defined such as maximum building height, buildable area, and the type of facilities. Then, true to form, the developers withdraw into seclusion. The Chinese business tradition prescribes absolute secrecy and the conjoining sites are developed without any mutual consultation. As a result, although each developer has carried out their own delimited market-research, no-one has considered the sum of actual needs across the area. We have branded this dominant phenomenon Check-mate real-estate* — the product of a winner-takes-all approach which leaves the home-owner and the average citizen struggling for quality of shared space. Generally there is a surplus of commercial facilities, a lack of public facilities, and oddly mismatched infrastructure. In addition the market research has a very short focus — basically until the apartments are sold. With the demography of China changing fast, this will leave floor space and parking space in short supply. Insufficient connections reinforce the extreme isolation of the enclave. At the same time the homogeneous nature and inadequate facilities maintain the dependency on the city. Against the danwei*, which provided for all the needs of its occupants, the modern Chinese enclave is highly reliant on logistics and puts a severe pressure on the infrastructure from the city to often remote areas. 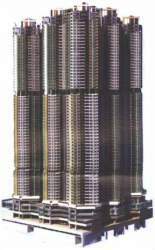 The initial prototype for the Chinese gated community was the compact tower. The apartments provided comfortable yet inconspicuous homes for an upper-class that couldn’t account for a large part of their earnings. Just like the secluded towers of cities in South-America, they generated small islands of extreme density in China’s otherwise loose-fit suburbs. From the point of view of sustainable urban development, these tower-communities for the upper middle-class are a blessing. The fact that both the average and the well-to-do Chinese urbanite lives in dense building blocks is a source of hope for China’s ever expanding cities. In a dream scenario, the urbanization currently needed to accommodate the immense number of new citizens could even reinforce and restructure the dispersed condition. However, as the economy grows stronger, predictably the built densities get lower. In the last two years the number of villa districts has exploded. In Shanghai alone real-estate developers have completed 59 gated villa communities in the last year (2004). And downtown construction sites have become increasingly expensive. For the upcoming middle-class a cheaper type of villa community has become available on land far away from the city. The consequences of this trend (increased traffic, disintegration of the urban network) have not been acknowledged. Yet this type of enclave is spreading fast, and small island communities are defining the urban mass around China’s mega-cities. Built as the gated version of the American suburb, they are fully dependent on highways and cars. The homes align themselves along the curving streets in strings of detached and semi-detached cottages with a small front and back yard and a carport*. Within the premises a select number of services are available such as a bank, a day-care center, a store and a clubhouse. 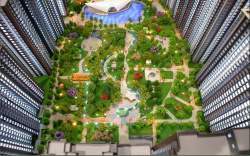 One of the largest gated residential areas in the world based on this model and has been built in Wuhan. Developed by a single company for a single community, it covers a million square meters. For its 200,000 occupants a range of services has been made available which include a complete package of social securities. Even though fully privatized cities are officially illegal in China, the gated community of Wuhan can compete with cities such as Celebration and Sun City in the US. The Chinese welfare state has paid the price for a wavering transition from socialism to a socialist market economy. Rapid but restricted expansion of the privatization of securities such as pension, health-care and education occurs from within the gated communities. For those who can afford it, the transition from welfare state to welfare city is smooth. More than the privatization of the housing market and the public domain it is the privatization of services and social security that constitutes the stratification of China. For the truly affluent, extraordinary security measures and a stringent set of rules are nothing to get distressed about. They voluntarily confine themselves to hermetically sealed suburban strongholds. North-east of Beijing thirty walled villa compounds are grouped strategically in relation to each other and the international airport. 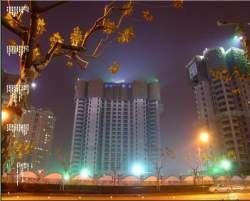 They are the ultimate Golden Ghettos* of China and set the standard for modern luxury and class. Their success seems to prove that as buildable land became scarce, abundance of living space gained importance. At the same time that compact tower blocks became available for the middle-class, residential areas for the upper-class with names such as Purple Jade Villas*, Woodland Villas and Golden Gardens began to flourish. Within the walls of these districts 80% of the ground is used for lakes, roads, gardens and parking. However, unlike the hyper-serviced tower blocks that have emerged in Hong Kong or the Wuhan welfare city, these gated areas are centers of unsatisfied demands. For most requirements the resident must leave the premises. To fulfill the full range of needs of these residents, a network of specialized facilities has formed around the gated communities. In similarly controlled quarters the best of what the city has to offer is assembled. A constellation of well guarded schools, sports and country clubs, shopping and restaurants form a complete support system. These clubs and societies are accurately attuned to the lifestyle of their customers; with each wall the exclusivity increases, fending off anyone not in step with the exorbitant admission fees. This makes for an extensive network of private clubs for the suburban jet-setter: a succession of lobbies, lounges and lawns, all enclosed by gilded gateways exuding inaccessibility. Nestled in the periphery of the capital, this closed network has engaged in a struggle for space with the still expanding forest of basic apartment blocks. Many of the occupants of these flats used to live in once thriving hutongs*, but they had to make way for the center to be refurbished and decongested*. Evicted from their homes without sufficient compensation, they were effectively expelled from the center and their hutongs* lifestyle, and forced to find refuge in the towers along the outer ring. However in contrast to, for example, the urban blocks of the banlieus of Paris, the inferior flats of Beijing are not only wedged between highways and peripheral clutter, but squeezed also by the walls of clubs and villa districts. In the suburbs, the involuntarily confined end up face to face with the voluntarily incarcerated: China’s stratification is halfway complete. Piper Gaubatz, ‘China’s Urban Transformation: Patterns and Processes of Morphological Change in Beijing, Shanghai and Guangzhou’, Urban Studies(1999), vol. 36, no. 9, pp..
Fulong Wu, Klaire Webber, ‘The Rise of “Foreign Gated Communities” in Beijing: between Economic Globalization and Local Institutions’, Cities (2004), Vol. 21, no. 3, pp. 203-213. Not only is China’s urban landscape being reconstructed overnight — our memory is being erased with the same speed and intensity. Grey communist China, its flavor, its hue and life, indeed its people, will soon be a thing of the past. The procedure is simple, consistent, and unquestioned. The first step is a blue sheet wall surrounding the area, decorated with cheerful red lights. Sometimes red banners are suspended from buildings about to be demolished with sympathetic slogans such as, ‘Stand hand in hand and help our neighbors move to their new homes’. Then the infamous Chai* sign (demolition) is daubed upon the walls. The new demolition site blends in effortlessly among the city-wide strings of anonymous blue fencing. In a matter of days the area is turned to rubble and becomes the building site for a new block. Finally, the more luxurious building sites are adorned with extraordinary billboards* representing promises of the future. Admittedly I have a bad memory, but this behind the scenes make-over seems continuously to purge my mind of what the city was like last time I looked. Painstakingly I try to recollect the feeling of walking in the streets near my house, left untouched until only weeks ago. The Chinese don’t suffer from nostalgia — not for their recent history anyway — so I try not to. But in China the new comes all at once and undiluted. The unexpected balance of old and new, large and small, cheap and top-dollar which, for a fleeting moment, seemed to exist in China’s mega-cities, is lost. It was only a temporary stage — a phase of construction and transition. Last summer (2006) was a case in point. I was having a drink in my usual coffee shop down the road when suddenly the street was swarmed with men in orange suits lugging drills. They set up and started work, uprooting cobble stones as they went, and within the hour had reached the place where I was sitting. Their blazing efficiency was striking enough, but real bewilderment only hit me when they started hacking away at the façade of the café. One moment I am sipping coffee within the comfort of an air-conditioned shell; only minutes later I am sitting still in my chesterfield, but now outside. The entire front part of the admittedly paper-thin wall of the old hutong* establishment was gone. In the bar I seemed to be the only one concerned by the fact that the building had just been cracked wide open. Utterly complacent, the owner remarks ‘I don’t think we’re sticking around much longer’. The old façade apparently had extended beyond the red line of the newly planned street. Over the next few weeks my favorite seat in Beijing was the borderline between jazz and coffee on one side, and heavy-duty diggers swinging inches from my head on the other. Though I kept close track of the progress made, it’s hard to explain what the muddled hutong* street was like before this invasion, and before the clean-up. On the whole the urban mass is becoming more distinct and more streamlined. Driving along the freeway toward Shanghai’s international airport the world looks clean and clear-cut. Rows of white walls frame the view to either side. Tree tops and orange and red pitched roofs hint at hidden parks and villas. In the last few years sizable drip-shaped sanctuaries* for the new rich of China have permeated the suburbs. The shapeless patchwork of concrete and grass is being replaced by clusters of closed communities, golf-courses and country clubs, which stitch themselves between the tarmac gutterways: micro-planning* in a context of over-planning*. Continuing past these walls, something of the world they conceal can be deduced from large signs placed at regular intervals. The placards present happy businessman and young families engaged in the homey activities of a western (or rather white American) lifestyle. At this point in China’s development, the signs show only single-child families. Amongst the keenly pruned hedges of China’s major freeways their message is very persuasive, and comes across as wholly earnest. They show that within the enclosure of the compound the safety and wellbeing of your family is secure. Even though the walled communities they promote offer a range of facilities that belong — or belonged — to the public realm, it’s hard to imagine these sterile and currently empty enclaves as tomorrow’s thriving communities. Nevertheless, for China’s upper middle-class looking to move to the periphery, private neighborhoods are the only official formula. Every highway exit presents another opportunity to enter one of the suburban safe havens. The highway is quiet, but the eight broad lanes anticipate an explosive increase over the years to come. And this strangely serene atmosphere does not sustain itself for long. All around, protruding over the homes and the lake, is a larger wall: a nearly continuous assembly of towers* creeps outward from the city center, looking down over the empty estates.